Do you believe in ghosts? In a city as chock full of history as Atlanta, it’s easy to see how one could believe in spirits hanging around town, perhaps at battle sites or cemeteries. When Halloween comes around, Atlanta has no shortage of spots to get your haunt on. Families can find a kid-friendly ghost tour at Stone Mountain Park, while thrill seekers can head to Fright Fest at Six Flags. But if you’re looking for ghoulish ghost stories with a side of spine-tingling history, then these six spots may be for you. Established in 1928, the Fox Theatre is a Midtown gem with its beautiful Egyptian-inspired architecture. Originally intended to be a Masonic lodge, the 250,000-square-foot theater has seen a host of cast members, staff, and visitors over the years, which is bound to lead to hauntings. It’s also rumored that the site of the theater served as Confederate ammunition cache during the Civil War. In October you can catch the annual Fox Theatre Ghost Tour and learn about the orbs that mysteriously appear in photos, shadows that eerily pass by, and Roosevelt who is one of the resident ghosts. Cemeteries are naturally goose-bump inducing spots, but Oakland Cemetery is particularly special. Just south of downtown on the edge of Grant Park, Oakland Cemetery was established in 1850 and is the city's oldest public park. Originally just six acres, it grew to 48 by the late 1800s thanks to the Civil War. 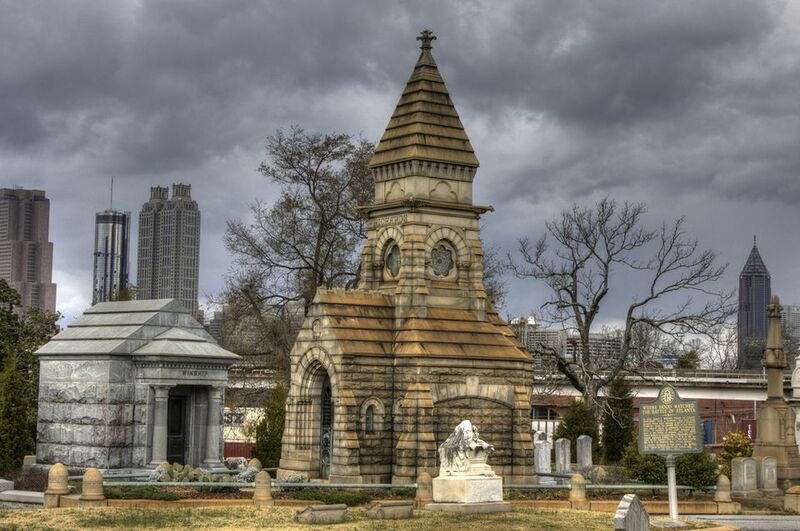 Although it’s the final resting place for generations of Atlantans, including city leaders, Civil War soldiers, and celebrities, it’s also strikingly beautiful with gardens, winding paths, and a killer view of the city. You can brush shoulders with the ghosts of Oakland any day of the year, but the place really comes to life in October when it offers the Capturing the Spirit of Oakland Halloween Tours. 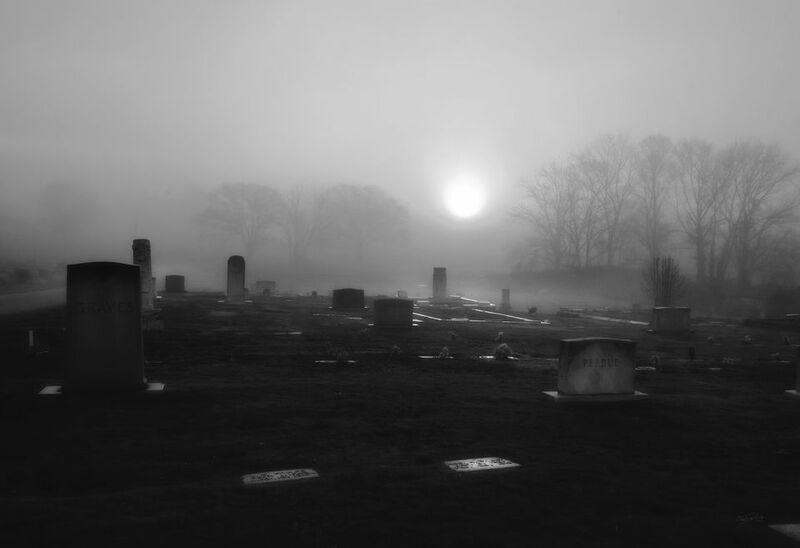 Not only do you get a moonlit tour of the cemetery during the most haunted month of the year, but you’ll also get to meet some of the most notable residents of the cemetery. If you get scared, hug your sweetie—it’s also one of the city’s best places to kiss. The second-oldest city in the metropolitan Atlanta area is bound to be haunted. Downtown Lawrenceville has seen a fire destroy its original courthouse in 1871 and destruction to surrounding farms by boll weevils in the late 1800s. Today, Lawrenceville thrives with a bustling downtown with restaurants, shops, and the Aurora Theatre. Despite the liveliness of the city, spirits still linger. One spot ghosts are rumored to be found in this suburb is Little Gardens, a 1800s plantation house turned event venue. Rumor has it, a woman died there in the early 1900s and is known to now throw dishes around—which would certainly make her a contender for the worst wedding guest. She’s not the only ghost in Lawrenceville, though, which is why the Aurora Theatre offers its annual ghost and cemetery tours. The 90-minute ghost tour takes brave souls around the square to hear the stories of paranormal activities that take place at the different businesses and the historic Old Jail. The 90-minute cemetery tour is offered on weekends only to a limited group of people who hope to encounter some of Lawrenceville’s ghostly spirits at their resting spots. Marietta is known as Scary-etta for a reason, and not just because it’s OTP. It’s also chock-full of haunted spots, such as St. James Episcopal Cemetery, where thrill seekers can encounter the marble statue of Mary Meinert holding two babies. Her face is faded, but her eyes are piercing, and if you visit her gravesite at midnight, she supposedly weeps tears of blood. The fear factor in Marietta doesn’t stop there. Head over to the Kennesaw House, which is now home to the Marietta Museum of History, and you’re bound to meet a couple of ghosts. Although it’s now a museum, the house has worn many hats—most notably being a hospital and a morgue during the Civil War. Reports of wartime hospital rooms materializing in the basement float around along with a ghostly female figure on video and orbs on security footage. If you’d feel better having some guidance while hunting for haunts in Marietta check out the trolley ghost tours, or the walking tours. The Ellis Hotel is a posh boutique hotel conveniently located downtown. Seems totally normal, except for the fact that it’s allegedly haunted. Constructed in 1923 as the Winecoff Hotel, the building suffered one of the worst hotel fires in American history in 1946. With no fire doors, alarms, or sprinklers, the hotel went up in flames and took with it the lives of 119 people. Since that tragic event the hotel has been refurbished and brought up to safety codes as the Ellis Hotel, but the spirits of those that perished in the fire still linger. It’s rumored that guests can hear children screaming and see apparitions, while and others have reported seeing ghostly visages in the window from the street. Picturesque Roswell with its bustling Canton Street is another thriving spot to catch lots of ghosts—the town even has its own ghost story, a book called Roswell: History, Haunts, and Legends. The author, Dianna Avena, runs Roswell’s famous ghost tour company—you may know it from the Syfy television show Ghost Hunters, where she and her husband conducted two investigations. You won’t find actors in costume on this tour; instead, you’ll find guides dedicated to studying paranormal activity. The 2.5-hour walking tour illuminates haunted spots in downtown Roswell, including Bulloch Hall, which is said to be haunted by a teenage girl who was a slave on the plantation during the war and fell (or possibly thrown) into a well in the backyard. Her apparition can be seen occasionally along with electrical disturbances.